There’s nothing quite so relaxing as a get-away with 6 wonderful quilting friends! We’re in Huntsville, TX at The Hummingbird Retreat, a fantastic small venue dedicated to quilters. Martha, daughter Angela and granddaughter Amanda are top notch hostesses, making it their goal to see that we are well fed and pampered. The individual work stations come with cutting mats, irons, plenty of work space and design walls. The bedrooms are all equipped with their own bathroom, the beds are comfy and each is adorned with a beautiful quilt. There’s a common area with a big screen tv, a wonderful back porch with a view of the livestock off in the pasture and the decor is full of vintage pieces sure to take you back to the 40’s and 50’s! Thanks Hummingbird Retreat, we’ll be back! Click on the blue link above and scroll down to Nov. 12, 2016 for a great article with two points of view about quilting vintage pieces. I’m honored that she opens up with a picture of my work, this blue and white 1940’s-50’s Bridge Tablecloth will always be one of my favorite projects. Now in a private collection, Rita Carter was kind enough to loan this tablecloth to the Special Exhibit: For the Love of Linens at the IQF Houston last week. What are your thoughts? Are you OK with quilting these vintage beauties and putting them on display or do you think they should be left in the linen closet? Pinterest, Instagram and so many web sites have wonderful examples of the move underway to bring the “old” to the forefront with a tribute to those who created before us. I’m a big fan of honoring the original artist by showcasing his/her work in this manner. Happy stitching, and until my next post, hope it’s a great day! My method of creating hexagons. I must give proper tribute to Sarah Lizzies Handmade as this blog creator was my inspiration for my hexagon quilt titled “Second Chances”. The minute I read thru her blog and studied her pictures, I knew I was hooked. Her work is wonderful! I plan to walk you through my method of creating Second Chances, probably step by step so if you’re interested, you’ll have all the tools you need to start. 1. White stabilizer, I use machine embroidery cut away, 2.5 weight. In the industry this is known as medium. But then again 2.0 is also labeled medium… Heavy weight is 3.0. I’d caution to go heavier than lighter if you’re not sure. 2. 100% muslin. I used Bleached Muslin rather than natural. 3. A template. I used a rose colored acrylic hexagon template made by Sharlene Jorgenson for Omnigrid. See picture below. 4. A selection of vintage linens, handkerchiefs, napkins, dresser scarves, doilies, trims, laces, buttons, ribbons and beads. The rose colored template measures approx. 3 1/2″ per side and finishes to a 3″ hexagon. The picture on the right shows a hexagon cut from stabilizer and I’ve drawn 1/4″ lines on all sides. You’ll see when finished my hexagon will have 3″ sides and measure about 5 5/8″ from point to point. Step 1: From both the stabilizer and the muslin cut a hexagon from each. The stabilizer is the bottom layer, the muslin goes on top of the stabilizer. With a Frixion pen (by Pilot) and a small ruler, draw a line 1/4″ from each edge. This line will serve as your guide regarding placement and embellishment. Everything you want to be visible on your finished hexagon needs to be inside these 1/4″ lines. Step 2: Begin choosing the pieces that work well together. Remember, a white piece allows you to dictate the color direction and embellish in any manner you like. These yellow embroidered flowers are part of a handkerchief. I placed 5 pieces of laces and trim around the flowers and lightly hand tacked the pieces in place. Beading is simply this: threaded needle up through the fabric, pick up a bead or 2 or 3 and send your needle back down through the fabric. I do not knot the thread after each bead, you’re not creating a utility piece but rather a show piece that will be handled with care. Let your pieces help to determine how and where to bead. By following the flowers in the white trim along the left bottom side I was able to loosely mimic the yellow flowers of the handkerchief. In fact I chose to bead all the flowers in one shade of yellow or another to give the piece consistency. The picture above is of the hexagon with the finished embellishing. It’s at this point I machine stitch with either a straight or a zig-zag about 1/8″ all the way around the piece. We’ll talk about batting and the framing of the blocks sometime this month, right now let’s just concentrate on block creation and embellishment. 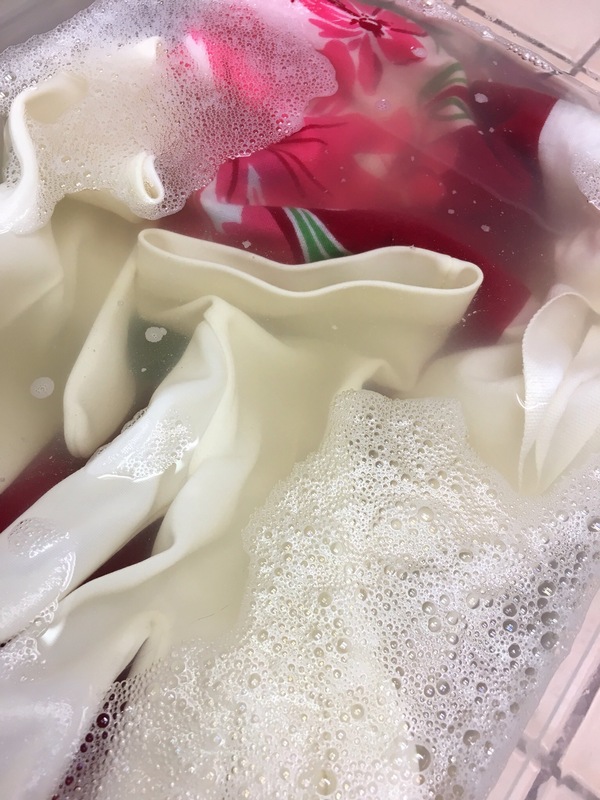 Why would anyone take pictures of their soiled vintage linens soaking in water? I think I do it because I’m so amazed at how disgusting the water looks! I get asked all the time how I clean the little treasures that follow me home from antique shops, thrift stores, etc. Disclaimer: what you are about to read is how I do it….. Your results may vary. *** Look your item over thoroughly! 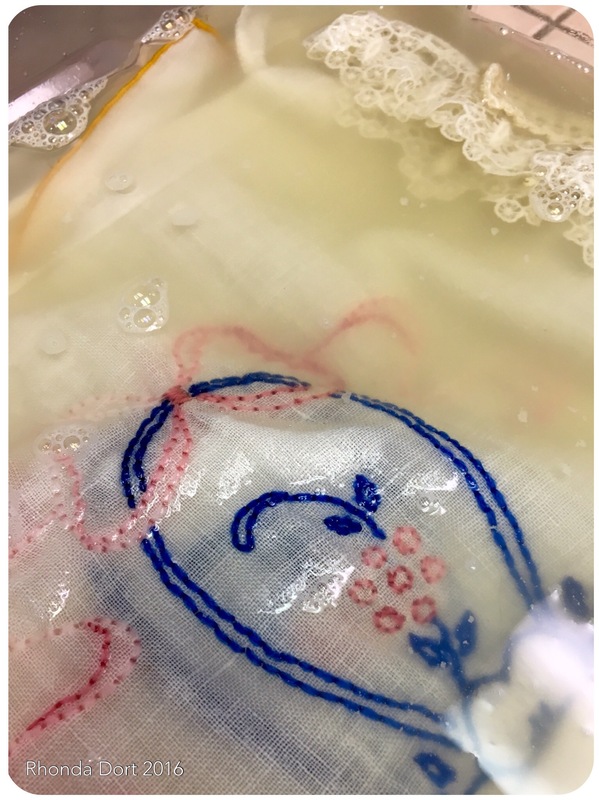 If there is ANY black and/or dark grey embroidery floss do not use this cleaning method! 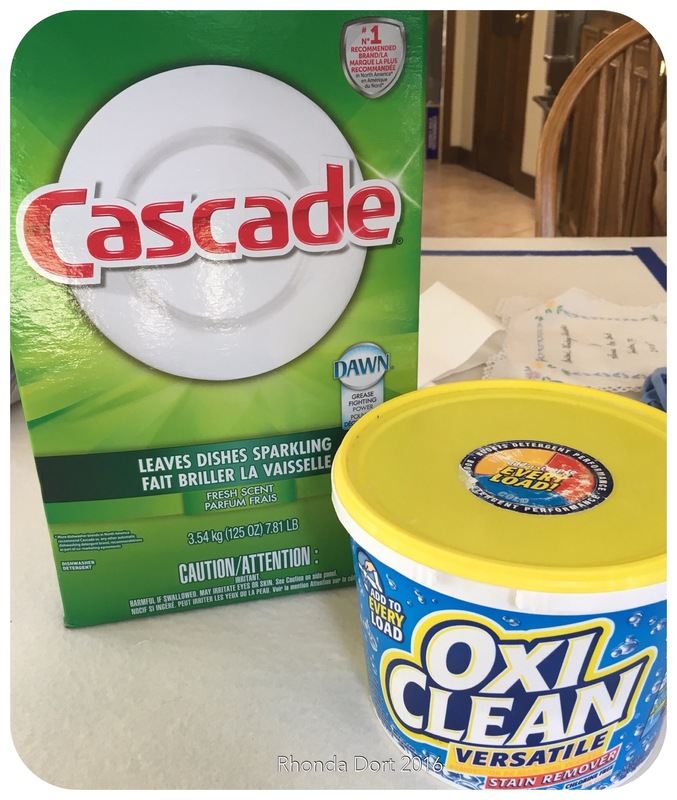 Stick with just Biz or OxyClean and be careful! Step 1: Read through each of the 6 steps before you begin! Step 3: In a plastic bin/container/glass bowl first add the 2 powders followed by the water. Stir gently to dissolve the powder. I find the powders never dissolve completely so just stir until you’re comfortable that you’ve got things mixed up. 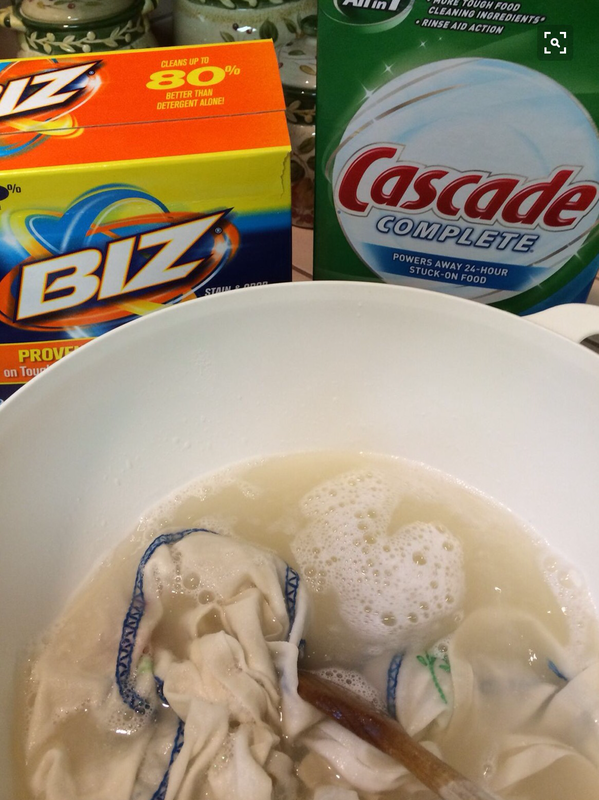 Step 4: Begin layering your items on top of the sudsy water. If necessary gently fold them to fit the container you’ve chosen. I usually add as many items as I can to the container, just make sure the top layer can be fully submerged. Throughout the soaking process I gently-and I do mean gently-push down on the soaking items with a long handled wooden spoon just to move the water around a bit. If you find your items floating to the top you can always keep them submerged by placing a non-metallic dinner plate, bowl, saucer, etc. on top of them. Step 5: How long to soak? This is something only you can determine. It’s rare that I soak things for longer than 24 hours. If I am nervous about an item I’ll shorten the soaking time to not more than 3-4 hours. Step 6: Rinse and rinse and rinse like there’s no tomorrow! When you think you’re finished, rinse once more in a container of cool water with 1/2-1 cup of white vinegar in the water. The vinegar will cut any soap that the fibers might be holding on to. Very important step! Note: when dry, your linens might retain the aroma of the vinegar for a day or two but it will dissipate. What’s next? 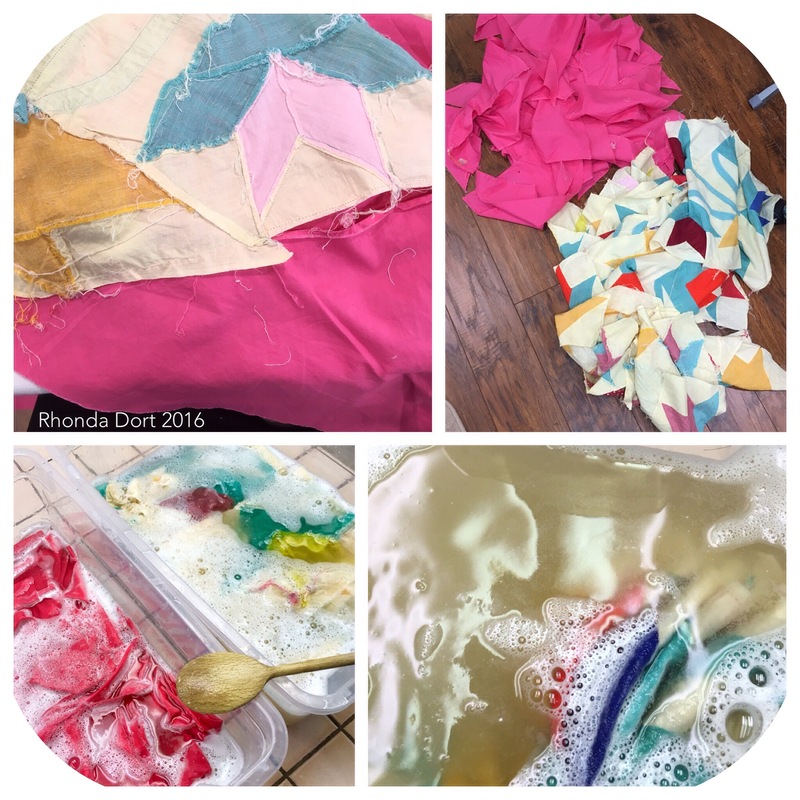 Either put your pieces in the dryer or lay them out flat to dry. Ok, here are the pictures, like I said, the water is gross! Happy soaking! You and your nose and your neighbors’ nose will be very glad you took the time! International Quilt Festival 2016 Houston! As a side note, check out the orientation of my piece on the big screen…yep, they presented it sideways. Sideways on the web site list of winners also. I got an email from IQA yesterday saying the finally fixed the picture, I’ll check it out later. It has been such a pleasure standing with this piece and talking with everyone, such kind words from everyone. I plan to dedicate a separate post about this quilt and its step by step creation later this week. This is My Garden, an adaption of a pattern titled My Primitive Garden by Lisa Bongean, owner of and designer at Primitive Gatherings This piece is wool on cotton hand appliqué. I gathered cotton background fabrics and collectively dyed them all together in the same vat in order to create continuity of color. I shopped resale stores for 100% wool garments, felted the wool and hand dyed each to get just the right color for each piece. The entire project is hand appliquéd and hand embroidered. I quilted this piece on my Innova longarm. This quilt is on display in the Traditional Appliqué Category.